After ten years of teaching, you can't help but to notice a few things in the classroom. One of them, unless you're a lecturer as opposed to an adaptive instructor, is that every class is different. It only makes sense because the students are different. This year, my class seemed especially quiet compared to the year prior. At first, I thought it might be because of the smaller class size, but I was convinced it was something else by the third lesson. Seriously. They were so quiet, I almost thought adding keynote presentations during a portion of the class was a mistake. I might have even skipped keynotes all together had three guest speakers drawn the same quiet, nodding heads. There was that, and I read an article in Communication World by Steve Crescenzo, owner of Crescenzo Communications. He said there were two types of communicators: nodders and translators. Translators, Crescenzo wrote, know that if they walk out of the interview without understanding the topic, there is no way they can write an article that anyone else will understand. Nodders, on the other hand, hold back on asking questions because they don't want to look stupid. The article struck home at first. My class was stacked with nodders. But was it really that simple? Looking back on past interviews and classes, I knew it couldn't be that easy. Maybe there are four types. • Nodders. While Crescenzo attributes the nodder to being afraid to look stupid or ask dumb questions, I don't believe all nodders are created equal. Sure, some try to fake their way through without looking ignorant, but some are like sponges, analysts who sit back and consider every word spoken with the intent to research anything they don't understand afterward. There is nothing wrong with that, but sometimes they leave the speaker or interviewee guessing. Do you get that? • Talkers. This is one of two styles we might add onto Crescenzo's thinking. Talkers command the floor. They don't ask questions as much as they make statements. Inexplicably, they don't always allow the speaker or interviewee to complete a thought before they lead them with a question that opens up dialogue for their stories and statements. They already know the answers so questions aren't really part of the equation. They already know what you need to do. • Translators. As Crescenzo notes, translators know they not only have to understand a topic, but convince the speaker or interviewee to communicate in ways that the average person might understand it. They have many tricks and tactics in order to accomplish this task. Sometimes, they will ask the same question several ways. Other times, they will ask for examples. And yet other times, they will direct the speaker or interviewee to assume the readers/listeners don't know anything. • Conversationalists. As the second add on, these folks are fascinating people who frequently drift away from the topic or spend ample time asking questions about the speaker and interviewee. Sometimes they are even forced to scramble during the last ten minutes of a meeting to cover questions they know they need to ask and tend to be surprised when the interviewee announces they have to leave for the next meeting. While the dialogue is always engaging, the social chatter sometimes overshadows the topic. Crescenzo suggests that the translator has the advantage. While I would normally tend to agree because this style seems to complement the other styles, it seems to me the best interviewers need a more adaptive approach. 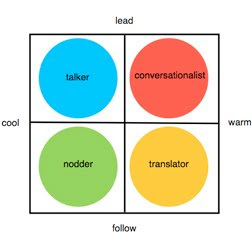 Nodders tend to win over talkers and translators help conversationalists stay on track. Conversely, talkers can draw out nodders and conversationalists welcome varied duplicate questions posed by translators. The best interviewers quickly assess and adapt their style to what seems like the best match. Sometimes, saying nothing works. And other times, interviewers have to fill the silence or else the entire session will go bust. More importantly, never assume any style conveys anything about the other person. The nodder might be afraid to look stupid. Or, they could be analyzing your every word because you haven't stopped talking. Case in point: the interview that unraveled Richard Nixon consisted of a single question. When no other questions were asked, the talker filled the silence.